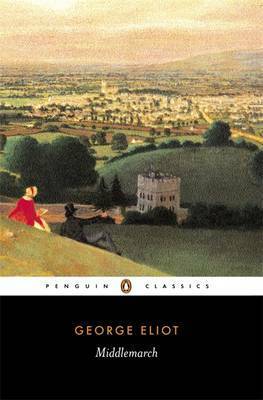 Although I’ve read other George Eliot novels, Middlemarch has always scared me a little – in part, because it always seems to end up on the greatest books of all time lists. The other part is the length – my copy was 900 or so pages long, which is long! In the back of my mind, though, I’ve always felt I’ve been missing something by not reading it. That’s why I included it in my classic club list. Then I received a review copy of My Life in Middlemarch, a book a really wanted to read – but without spoiling Middlemarch itself for me. So, it felt like (almost) now or never and I cracked the spine. I’m really glad I did – even if I’ve pretty much read nothing else for the last four or so weeks – because I loved it. Set in the 1830s, Middlemarch is the tale of residents of what Eliot describes as a provincial town. They include Dorothea, who makes an unsuitable marriage to the much older Mr. Casabaun; Mr. Ladislaw, Casabaun’s nephew who he supports but comes to dislike and distrust; Mr. Lydgate whose modern thoughts on medicine make the establishment dislike him but whose recent arrival makes Rosamond fall in love with the idea of marrying him; Fred Vincy who doesn’t feel the need to study or take life seriously as he is bound to come into an inheritance; the Garths, whose life Fred almost ruins with his recklessness; and Mr. Bulstrode whose past comes back to haunt him. There are many other characters too and each life weaves around the others as they often do in small towns or social circles. For many of the characters, their stories are of love, and it’s (sometimes) disappointments. They are also stories of how people grow – older and (if they are lucky) wiser – of how simple things, thoughts and feelings, and the decisions they lead to, can have such a huge impact on their lives and those of others. And how actions are so often based on how we perceive things and how we wish to be perceived, even if this means we go against our better judgement. The fact there are so many stories being told and there are so many strong, interesting, characters are two of the things I liked most about the novel. I also like Eliot’s writing style, even though it can be a bit “meandering” at times. She is smart, witty, and insightful, and has a way of pointing out the absurdities in life. Absurdities which apply very much to the now, not just the way back when this was written, because human nature doesn’t change that much, or that quickly, and books like this remind us of that. So, if you have a month to spare, definitely one for the reading list (unless you’ve read it, of course, in which case I would love to know if you enjoyed it as much as I did). I feel compelled to read Middlemarch, but I’m also so intimidated by it. I have a BEAUTIFUL cloth-bound edition that is begging to be read, but it’s just so long! ‘One of these days’, that’s what I keep telling myself. Congratulations on finishing it – not a small thing to accomplish!